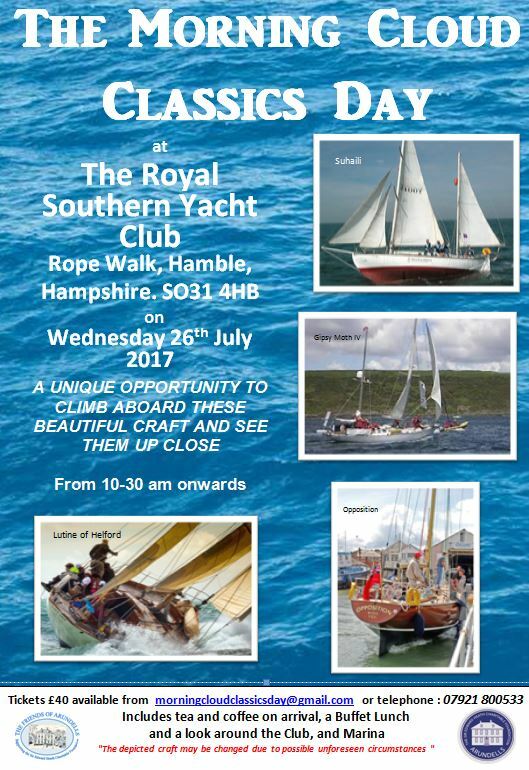 The idea for this occasion was borne last year when it was suggested that whilst our talks had become popular perhaps we ought to diversify into alternative sailing events so the Sailing Strand would not become dull or repetitive, plus at some time we may run out of guest speakers. In 2014 The Friends of Arundells re-kindled a link with the Royal Southern in fulfilling a promise made to Colin Hall, Commodore of the Club at the time in 2004. A promise made by Edward Heath that a memento of his would be given to them in due course. Of course soon after in 2005 Edward Heath sadly passed away and this promise was lost. Bob Hayes and Giles Ball worked with David Mead and some ideas were discussed including the memento, so soon after a half model of MC2 (now Opposition) was presented to the Club followed by more discussions and so the Classic Yachts idea came from these talks. The day was marked as gloomy with rain conditions forecast well ahead of the day but this did not deter the excited team either before the day or even on the morning as well it was proved later. Because of holidays and the annual regattas taking place around the South coast the numbers were not as hoped but even so we were 45 in total and the Classics were well in place tied to the down river hammerhead pontoon. Opposition and Suhaili arrived Tuesday and early Wednesday Thalia and Lutine of Helford arrived in good time for their skippers and crew to partake a coffee in the upper bar. We eagerly waited to hear of Gipsy Moth IV's position but sadly learned that she was stuck in Beaulieu without a crew after a long haul up from Plymouth. Nevertheless all craft were on the pontoons close together decked out with their flags making a colourful show for our guests. The expected rain was light and intermittent so did not deter our guests making good their visit to each yacht and inspecting the delights of below decks. Lunch after drinks at the bar was well received and words of welcome were given by the Commodore, Karen Henderson-Williams, followed by a vote of thanks from The Sir Edward Heath Foundation Trustee, Edward Bickham. Grateful thanks was given to the owners/skippers, Peter Wright and crew of Opposition, Sir Robin Knox-Johnston and crew of Suhaili, David Aisher of Thalia and James and Rachael Youngman of Lutine of Helford. Gratitude was also expressed to Chris Hogan and his team plus Michelle Cox and Tim Thubron for their terrific help and cooperation in making this a well run event. Ivan Smith was guest of the RSrnYC for the day accompanied by Wendy Read and David Mead (ex Commodore) attended as guest of The Friends of Arundells. The day continued to be cloudy but still kind and sufficient for another afternoon viewing session of the beautiful craft on display. Bob and Giles were supported by Gerald Gibson, Bob Green, Diana Thomas, Malcolm Green and our erstwhile Admin/production team Ron and Jean Carter. A wonderful day all round enjoyed by all.